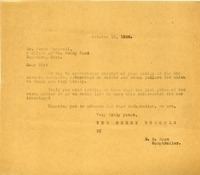 Letter to Frank Campsall from The Berry Schools asking for acknowledgement of his receipt of their letter in regards to the price of the stump puller shipped to them the previous spring. This is a letter to Mr. Hoge regarding the prices of stump pullers. 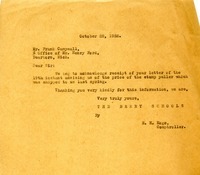 Frank Campsall writes to E. H. Hoge with literature about hoists and stomp pullers.